Such as Acer and Asus in the computer exhibition Computex in Taipei, Samsung also introduced his own devices with Windows 8. 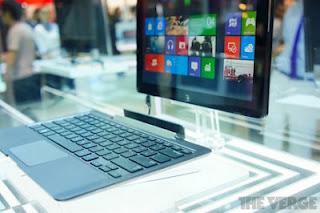 Samsung Series 5 Hybrid PC, this device has a design like the laptop in general, but also could be a tablet. Samsung did not provide details on the specifications of this device.However, the designs are similar to Asus's Transformer, a tablet that attaches the keyboard. of battery life this device is capable of supplying up to 10 hours. On the other hand, pinned resolution 2 and 8 megapixels. In addition, the device also supports pen input such as S-Pen. computer is not using the prototype chip based on ARM, x86-based instead. This means, the latest Samsung devices are not only able to run Windows 8 RT, but full Windows 8. When viewed more deeply, the computer uses an Intel CPU with Clover Trail requires only two watts of power alone. Perhaps this is why the name 'Hybrid' is used Samsung. Other specifications, there is a USIM slot, microSD, and a SuperSpeed ​​USB. estimated, the computer has a screen size of about 10 to 11 inches. While it weighs about 747 grams and a thickness of 9 mm.